Get your hands on the 2018 Daymak Roadstar, the electric mobility scooter that commands attention. 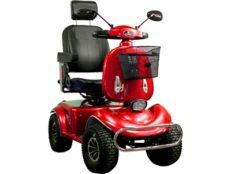 This electric scooter comes with a 60V 20AH SLA battery pack that can comes with some serious torque. With a range of up to 40 km on a single charge be sure to travel. The Roadstar includes parking brakes and a lockable carrying case for all your storage needs.